Need A Motorcycle Oil Filter? A motorcycle oil filter is part of your bike's first line of defense against engine wear. Maybe you depend on the folks at your local cycle shop -- and their good judgment -- to give you either an original equipment oil filter or an alternative product they consider right for your bike. Or maybe you shop on-line or otherwise rely on your own judgment to determine which oil filter best suits your motorcycle and will provide the protection you want. Either way, here's info to help you make sure you're getting a high quality oil filter that works well with your motorcycle and protects its engine from excessive wear. Without an effective filter, many contaminates and metal particles would overwhelm and compromise the oil's effectiveness, which would lead to extreme engine wear. Organic contaminants include airborne fungus and bacteria. If this stuff gets pulled into your engine, it can grow in the oil and create sludge. Inorganic contaminants like dust and dirt can also get sucked into the engine and wind up in the oil. The oil also picks up metal particles scraped off cylinder walls and engine bearings. You want an oil filter that will catch and prevent the majority of such crud from circulating through your bike's engine. 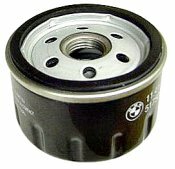 A typical "spin-on" oil filter -- the type that looks like a metal can -- captures contaminants and metal particles as the oil flows through a filtering material/element inside the can. Motorcycles need a high quality oil filter that can trap particles as small as 25-30 microns. Just for reference, a human hair is about 65-70 microns wide. Many economy products use paper as a filtering material. This stuff doesn't last long and it doesn't trap the smallest particles. Better quality products use various synthetic filtering materials. And top-end products use extremely fine glass micro-fiber filtering materials. These work best. A spin-on filter has a thick rubber gasket on the bottom that enables you to tighten down the filter, create a good seal and prevent leaks. The filter's base plate holds the gasket. The plate is perforated with holes that start just inside the gasket. 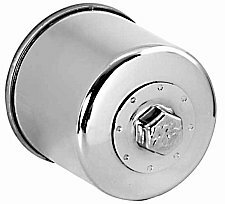 A large, threaded hole in the middle of the plate lets you screw the filter onto the engine. The motorcycle's oil pump pushes oil through the base plate holes and into the filtering material. The oil moves under pressure through the filtering material then into a central channel that directs the oil back into the engine. Looking down at the base plate, the filter element inside resembles a donut. The oil is forced inward through the donut's sides toward the hole in the middle. Then it flows up through the hole, out of the filter and back into the engine. Oil filters have a safety relief valve -- it's also called a bypass valve. The valve ensures oil will continue to flow into the engine if the filtering element gets clogged or the oil is very thick -- as it can be when extremely cold. When the valve opens, the oil bypasses the filtering element and flows freely into the engine. The relief valve on a motorcycle-specific oil filter will pop open at pressures as low as 8 to 11 psi. Filters designed for more robust auto systems will open between 11 to 17 psi. It is important to know a filter's relief valve specs so you can avoid substituting a less forgiving auto filter for a motorcycle-specific filter. Most filters have an anti drain-back valve. Such a valve is vital for filters mounted horizontally. When you turn off your engine, the anti drain-back valve prevents oil in the filter from running back into the oil pan. It keeps the vile, damaging crud the filter has captured from flowing into your engine. Some motorcycle engine lubrication systems can pump more than a gallon of oil a minute at pressures approaching 100 psi. When operating at these -- and even lower -- pressures, you can see how quickly a motorcycle's oil pump can force every drop of engine oil out of the bike if the filter's base gasket breaks or blows out. No oil, no engine. You're facing permanent if not catastrophic engine failure if the motor is suddenly running without oil. Time, not mileage, will cause a base gasket to harden or soften excessively. Either way, the gasket will lose its ability to keep the filter tight and in place. Engine vibration can loosen the filter, create leaks and cause your motorcycle to lose all engine oil. The takeaway message here is that the age and quality of an oil filter's base gasket is key when determining when to replace your motorcycle oil filter. When should you replace your motorcycle oil filter? The folks who built your motorcycle surely provide oil- and filter-change info that factors in driving conditions and mileage. You can't go wrong by sticking to these recommendations. Changing oil more often than recommended wouldn't hurt, either. Otherwise, because your motorcycle oil filter is continually capturing junk, you'd be wise to install a clean filter about every 3,000 to 5,000 miles. I believe the tips and ideas I’ve offered above will help you immensely to choose a motorcycle oil filter that best fits your bike and your needs.